Some years ago, while listening to a Bible teacher named Malcolm Smith in a recorded teaching about Jesus, he said something that has stuck with me, and I myself have adopted it as something that I regularly say to others. He said, “It takes a long time to think about Jesus.” At this stage of my life and journey with Jesus, I’m confident that it takes a long time to think about lots of things (including Jesus). I often reflect back on things I once said, believed, or taught and think to myself, “If you could go back in time, you would take yourself aside and tell yourself that you got some of it right, but there was more thinking to be done.” This post itself is the result of an insight that I have learned in hindsight, and I hope it proves helpful to you as you read on. Speaking of hindsight as a key to theological insight, let’s talk about Moses. Remember the story in the Bible when Moses asks to see the glory of God? It’s in Exodus 33. In the story, we learn that Moses would regularly meet with God and talk with him “as a person speaks to a friend” (Ex. 33:11). But from Moses’ perspective, God had not shown him enough of himself yet. Moses had not seen everything he wanted to see. The reason this comes up at all is that God was commanding Moses to do big things for Him and Moses’ response was essentially — “Okay, but first let me have more perspective — more insight — into who you really are.” Here’s how it reads in the Biblical text. There is so much here! St. Gregory reminds us that we do not stand above God as the objects to whom God is the subject. That is, God is not to be thought of or engaged as the subject of our objective inquiry. He is the creator and we are his creations. We do not stand in front of God as those who make demands of God, who tell God what he must do in relation to us. Even in our requests to God, which God obviously permits, he ensures that we are standing in the right orientation to him (behind him!) before we are permitted to see His glory. 9 Woe to anyone who contends with their Maker; a potsherd among potsherds of the earth! Shall the clay say to the potter, “What are you doing?” or, “What you are making has no handles”? 10 Woe to anyone who asks a father, “What are you begetting?” or a woman, “What are you giving birth to?” 11 Thus says the LORD, the Holy One of Israel, his maker: Do you question me about my children, tell me how to treat the work of my hands? 12 It was I who made the earth and created the people upon it; It was my hands that stretched out the heavens; I gave the order to all their host. (Is 45:9–12 NABRE). 24 Then Jesus said to his disciples, “Whoever wishes to come after me must deny himself, take up his cross, and follow me. (Mt 16:24, NABRE, emphasis added). It has always been interesting to me to think about why, after Peter’s confession, Jesus “strictly ordered his disciples to tell no one that he was the Messiah” (cf. Mt. 16:20). If what happens to Peter in the verses that immediately follow his confession is any indication of the reason (and I think it is), then we have a great example of how we can give correct and even inspired answers about things on the front end, but not really understand what we’re right about until we see them in hindsight; that is, until we are rightly positioned as followers behind the one we are rightly professing as Christ. That may be a good segue into another observation before I end with a final word of encouragement. If you search the Bible for the word trinity you’ll never find it. If you go looking through the pages of the Bible to find a list of the books that are inspired by God, and therefore, worthy to be included in the Bible, you’ll never find it. If you look in the Bible for some of the Christological language and formulations found in the creeds (like the phrase “consubstantial with the Father” as in the Nicene Creed) you won’t find it. These things were formalized and formulated hundreds of years (!) after the Church of Jesus was born. By the way (please stick with me here), if you are a “bible alone” Christian, then there’s no way to ever produce a Bible, for the Bible does not tell us what must go in it. The Church does that because the Church, not the Bible (according to the Bible) is “the pillar and ground of the truth” (1 Tim. 3:15). If you could take a time machine back to the first decades of the Church and find some Christians, you would discover that they were still sorting lots of things out. The first Gospel (Mark) was not even written until thirty-plus years after Jesus had ascended to the Father and yet the Church of Jesus was growing and expanding during those decades. The other two synoptic gospels came later than that, and John’s gospel likely was not written until toward the end of John’s life — perhaps forty or more years after the ascension of Jesus to God’s right hand. So, what were the Christians (especially those who wrote the Gospels) doing with their time? Why didn’t they write things down sooner? I think at least two reasons (and they are both related!) help with the question. The first reason is eschatology. In short, the earliest Christians believed that Jesus would return within their lifetime. As we know, he did not. Were they wrong about the second coming of Jesus? Well, they were wrong about the timing of it, to be sure, and they were the first ones to hear about it from Jesus himself. Paul’s letter to the Thessalonians (perhaps the earliest document written in the New Testament) seems to be, among other things, a response to the fear and concern among early Christians that Christians who had died before the second coming would be left out of the Kingdom (see 1 Thes. 4:13-18). In hindsight, they gained insight and determined that they may not have thought things through completely. There is no new revelation, for Jesus himself is the full disclosure of God to humanity. He is the final and embodied Word of God (cf. Heb. 1:1-2). But that does not mean that there are no more insights to be gained through our continual interaction with what has been revealed. In this regard, the Church continues to both “hold fast to the profession of faith” (Heb. 10:23) while she remains committed to learn, grow, and in some cases, create new ways of articulating and clarifying the once-for-all-faith delivered to God’s Holy people (Jude 1:3). Again, there was a time when the word trinity was not in the Church’s vocabulary, though all the material for understanding it as truth was seen and articulated in hindsight. This idea from St. Gregory may help us to remember that we don’t get to see the full glory of God while facing God as though he is reporting to or moving toward us. Rather, God moves by us and ahead of us while, in some ways, we are hidden behind structures that veil our sight. 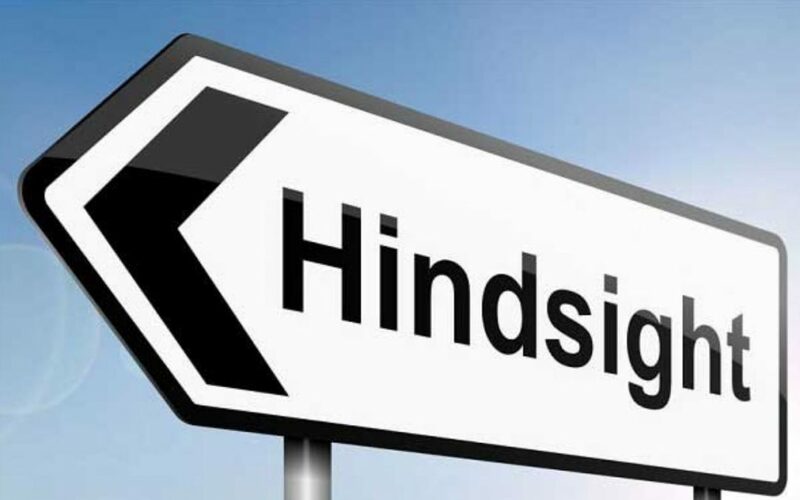 It is only after God moves, and when we are rightly oriented behind him and following him, that we find the insight and perspective gained in hindsight. So keep following Jesus. For it is from that vantage point that we will come to see what presently remains hidden to our eyes. In this way, hindsight will be one of the ways that God opens our eyes so that we can see.